Our children are our lifeline. Our continuity as a community is dependent on it. As such, it is imperative that we invest heavily in our children’s synagogue/communal experience. Gan Tikva, for ages 2-5, is a fun program which includes games, toys, stories and many fun activities with plenty of yummy snacks. Our youngest members have plenty space and time to enjoy Shabbat mornings with their friends in a fun, loving and safe environment. 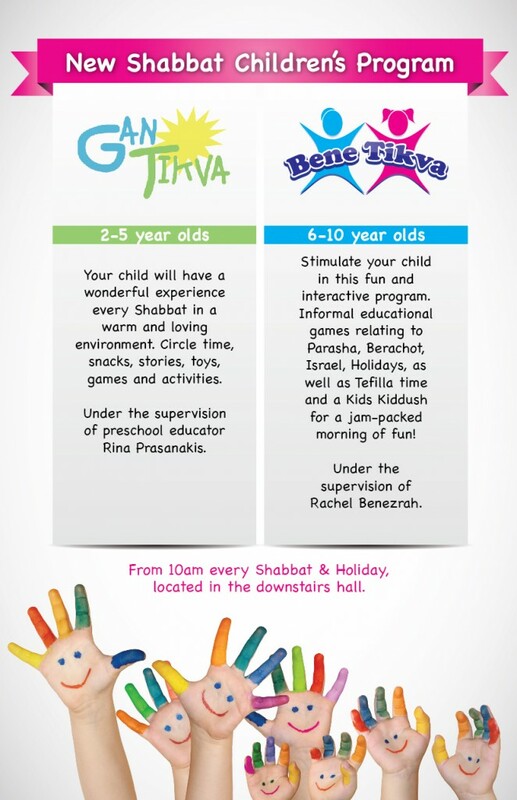 Bene Tikva, for ages 6-10, is an exciting, informative and interactive program which sees children of this age engage in plenty of games, trivia and educational fun. The Kids Kiddush is a highlight of this fun-filled morning as are the many prizes given for simply attending and having fun. We ask that all parents encourage their children to attend the Shabbat Program. Both you and your child(ren) will find the experience very rewarding. Established in 2012, the Boys Minha Program invites all fathers and sons to attend at Petah Tikva every Shabbat during the winter months for some fun, learning, refreshments and prizes. JStixx, for babies ages 6 – 24 months, is a high energy interactive class that exposes babies and toddlers to sounds and songs that use percussion instruments.